This was the first stop that we were really able to do today. We got our wires crossed on one and were looking for the wrong thing. We will return and we will do it with a trash bag. On the second stop there were muggles all about. We will return there at night. 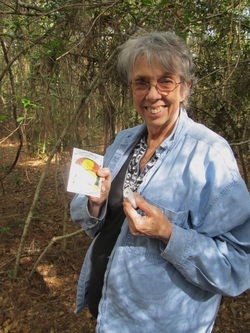 On this one (geocache #1 for the day) we started down the path and then she told me that the prize was two tenths of a mile. When the path stopped we found another approach. We got back in the car and started over. This path was much more inviting . And this was our little tupperware pot at the end of the rainbow. Sally took a little gnome out of the pot and left a tiny flashlight IIRC. This pot had, among other things a small new testament bible as a prize. This was a little spookier. 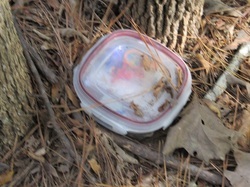 It was beside a cemetery but it was way back in the trees with artifacts from homeless folks all around. I've included them in the slide show. Another cemetery. Look at all the places to hide a log. 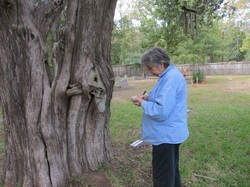 This is Sally filling out the log which actually was not found in this tree. Have included a sequential slide show. When you have time on your hands, this is fun to do.